My studio day was not really lost. I just didn’t work there, today. Instead I made 2 loaves of bread and some bolognese sauce for pasta for Bruce’s mom’s birthday party tomorrow night. (Along with some olive cheese puffs to bake for hors d’oeuvres.) 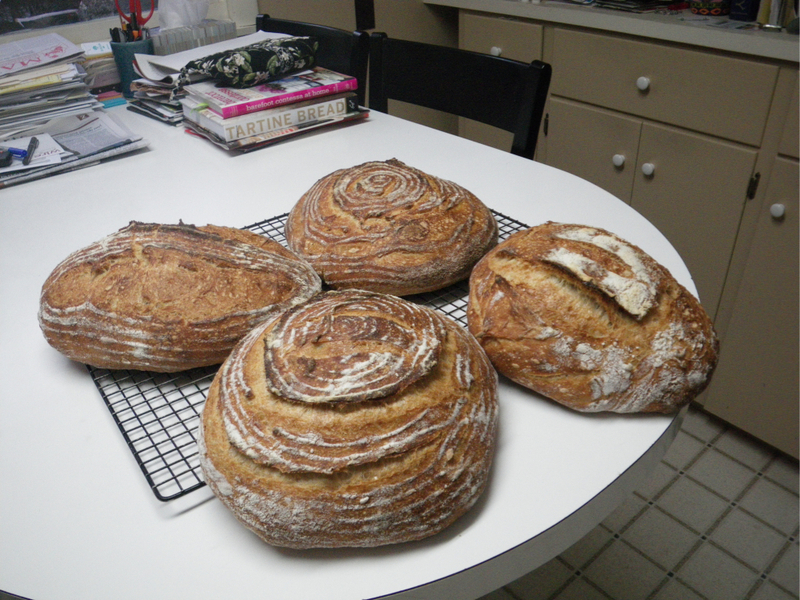 The other 2 loaves I took with me as gifts for the dinner party we attended in Ellsworth tonight. My friend Susan had arranged a birthday dinner at Simone’s restaurant for our dear friend Helen. One loaf for Helen and one for Susan and her husband Chris who were celebrating 20 years of marriage. Congratulations to all! 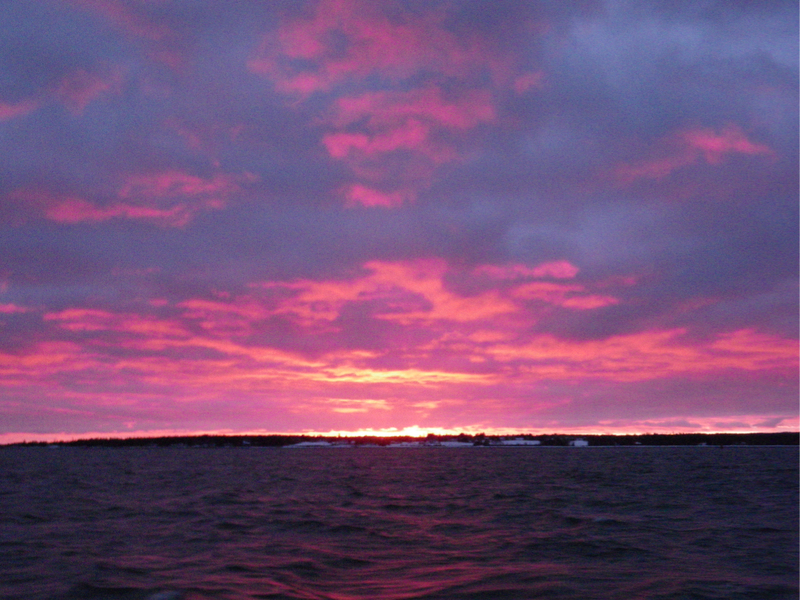 I took the 4 p.m. boat off of the island, and hoped there would be enough light to still read my book on the way to N.E. Harbor. There was enough for 5 minutes or so. Suddenly, Tiffany, who was sitting next to me , whipped her head around to look behind her and said, “Oh my god!” It took a second for each of us to grab our cameras, and run out to the stern of the boat. Where there were more passengers, mostly workmen, and many with their phones out snapping the same photo we were. that is a LOT of bread. i’ve never made a loaf in my life (i’m actually trying not to EAT delicious, buttery bread, so it would be a mistake to take that up as a hobby!). have you been making all those loaves from some native islesford mother you grew on your countertop (see, i listen, i just don’t bake bread)?! You are correct as usual queen Friday. I use my happy little island mother for bread. I’m adding bread baking to my things-to-do-with-Holly-when-she-comes-to-Islesford list! At risk of getting off track….recipe for olive cheese puffs? Please? I don’t know why your comment went into my spam box, but I was just checking through and there it was. ? Roll in ball. Freeze. Makes about 50. (I would say 40) Take out of freezer and bake on cookie sheet in 425º oven for 15 to 20 minutes. These don’t have to be frozen, but they are great to make up ahead of time and just freeze until you need them. You gotta love an hors d’oeuvres recipe from the late 60’s! Have fun! The same sunset Sarah photographed…amazing. Great fun last night. Peter ate your granola for breakfast this am and LOVED it. Beautiful sour dough bread is on the menu for tonight..can’t wait. Thanks so much Barb. Tell Bruce how much I really enjoyed talking with him last night. Have a great dinner tonight and Happy Birthday to Anna! I saw that same sunset posted several times on FB when I checked it after dinner last night. Fun to see that so many people got to see it. Thanks Barb, You’re right. They’re both nice. They just live too far away! Have a great party tonight!